One of the most impressive outdoor activities is; Canyoning. Canyon is originally a Spanish word (cañón) meaning ‘narrow gorge’. Canyoning is the descending into a gorge where water is flowing through it. 'Walking, swimming, climbing, sliding, jumping and descending on rope to make a trip through the canyon ' (Tempe, 2011). A canyon is a huge play area for young and old. Children from the age of 6 can have loads of fun, while the adults pushing their boundaries, with abseiling, big jumps and natural water slides! The fantastic surroundings and the image of nature is what makes canyoning always so incredibly cool! Via Ferrata is Italian and, in English, means in English ' iron way '. Sometimes it will be called ' klettersteig '. Via Ferrata can be seen as a mountain hike and climb together. A Via Ferrata route is secured with steel cables that are consolidated in the rocks to which the mountaineer can attach themselves. In addition to the steel cables, on more difficult and steeper passages, there will be other elements to it, such as stairs and bridges. By using these elements you can reach certain spots that you wouldn’t be able to achieve just by hiking. Via ferrata's come in different categories. From easy (for children and beginners) to very difficult (for advanced). In the region of ‘la Terra Alta ' is the famous cycling route: Via Verde, meaning the 'Green Road'. A perfect bike route where you can spend hours of cycling through the magnificent landscape and many old railway tunnels. It’s possible to rent mountain bikes and more comfortable bikes at Ebroasis. Transportation to and from the Via Verde is available if required. There are multiple start and end points but most recommended is to start at Benifaillet. The route from Benifallet to Horta St Joan is slightly ascending. You can choose how long you want to go cycling for. One thing is guaranteed: it is a beautiful cycling route! • Mountainbike: € 20,- p.p.p.d. With climbing and abseiling you need strength, insight and determination. The trick is to keep the body in balance and use the power from the arms and legs. When climbing there is no fixed route. The ideal route depends on the length of the climber, weight, personal preference and the size of the grips. In the beautiful climbing area of Tivissa, there are over 500 different climbing routes suitable for young and old. Canoeing is one of the most popular outdoor activities done on vacation. Also Ebroasis Fishing & Outdoor offers the possibility to enjoy a morning or an afternoon with the whole family to go canoeing. 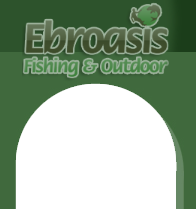 With Ebroasis Fishing & Outdoor you can go canoeing on the well-known River Ebro. Equiped with the famous Sit On Top canoes, you'll take the challenge of fast flowing river canoeing or a more sedate drifting Canoe trip. The choice is yours. Spend a morning or an afternoon enjoying the Sun on the river! For more information and / or reservation contact us mailen.